For Farmworker Awareness Week, we take a look at one of the nation's most troubling harvests. For many, a red, ripe strawberry elicits sweet memories of sunshine, summer, and childhood. Glorietta, a strawberry picker in California, has quite a different relationship with the fruit. Hunched over picking for up to 10 hours a day for a mid-sized commercial grower, Glorietta—who asked that we not use her real name for fear of retaliation—says her body hurts all the time. She says the farm’s foreman constantly berates her and the other farmworkers. And she says the farm often fails to pay her adequately for the hours she works. Worst of all, the strawberries Glorietta picks are making her sick. As she fills carton after carton, she experiences constant nausea, muscle weakness, and eye irritation from the chemicals sprayed. She says her employer does little to protect its workers from exposure. Thanks to groups like the Coalition of Immakolee Workers and Alliance for Fair Food there has been a great deal of coverage of the challenges workers face in Florida’s tomato industry in recent years. But strawberry pickers in California and Washington pick the bulk of the nation’s supply, and do so under equally extreme conditions, chief among them being exposure to pesticides. Not only do conventional strawberries contain high levels of pesticide residue (they appear on both a recent list from the Consumers Reports, and the Environmental Working Group’s Dirty Dozen list), but their production also requires chemicals that don’t directly impact consumers, such as Chloropicrin and methyl bromide, a “multisystem toxicant” used to fumigate the soil before the fruit is planted. Once the soil is treated, farmers often then apply a whole list of chemicals. And while there are some policies in place protect strawberry workers from these chemicals, lack of enforcement has often been cited as an issue. Still, strawberry workers and their allies are not without the power to make their workplaces safer. A few years ago, the UFW and a number of other advocacy groups worked on a successful campaign against the cancer-causing fumigant methyl iodide (which would have been used to replace methyl bromide). In 2012, the chemical’s maker, Arysta LifeScience, removed the product from the U.S. market. Another example Pinal cites is a public-private partnership with which the UFW is involved called the Equitable Food Initiative, which is certifying farms that put stricter than average pesticide rules and more thorough training in place. (A food label is in the works.) And just this week, farmworkers in Baja went on strike to protest low wages, leaving strawberries, zucchinis, and tomatoes rotting in the field at the peak of harvest season. 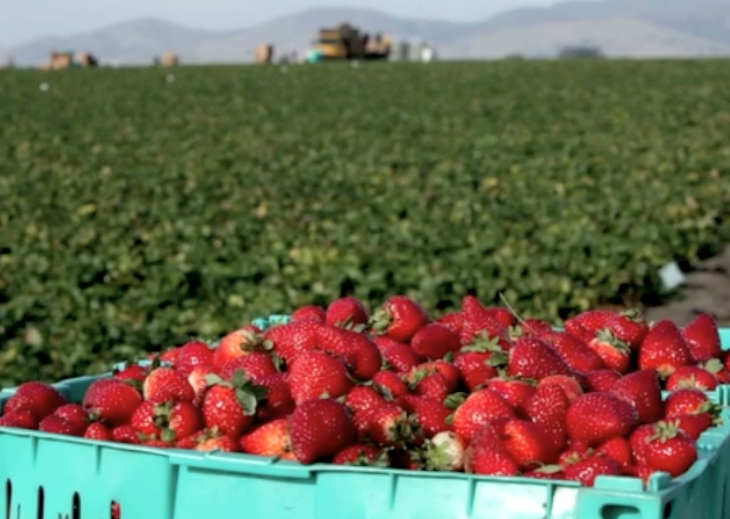 Santa Cruz, California-based Swanton Berry Farm has for years exemplified clean, economically feasible strawberry production that respects the dignity of its workers. In 1998, the partially worker-owned business was the first organic farm to sign a contract with the UFW, AFL-CIO, and has a worker-owner model in place. At the end of the day, though, consumers will likely have the last say. Earlier this week, Oregon-based Fair World Project sent a letter to the giant berry seller Driscoll’s with the signatures of 10,000 consumers who say they will not buy the company’s strawberries until it discontinues its relationship with Washington’s controversial Sakuma Brother’s Farm. Sakuma’s workers allege that the farm has for years been unwilling to sign a contract that safeguards their safety and fair wages, and the boycott has been underway since late 2013. Correction: This article originally stated that Chloropicrin was applied directly to strawberry plants. In fact, it is used as a fumigant before they’re planted. I already knew that industrial strawberries are not safe to eat. I did not know that the workers who pick them are subjected to the pesticides this way. Another good reason not to eat strawberries produced by chemical agriculture. Thanks for bringing attention to this. What should consumers do to support the farmworkers? Would boycotting strawberries just put them out of work? Does the purchase of organic produce translate to supporting the rights of farmworkers? I most definitely value the lives and rights of the farmworkers and I believe that along with this information we also need guidance on what to do next. This news is equally alarming and disheartening. Farmers are on the front lines, facing the full onslaught of exposure to dangerous chemicals. We have to pay respect and attention to their stories. If certain substances and agriculture methods are in fact as harmful as many of us suspect... anecdotal reports among farmers would be the first indicator. I see these stories more and more each day - and I don't believe in coincidences. Do you?